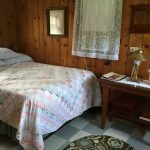 In 2016, we acquired Lanesboro’s Historic Knotty Pine Cabins. 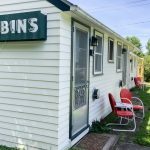 Built in the early 1940s by Elmer Brekke, co-owner of Lanesboro’s Brekke-Capron Hardware, who also built the adjacent blue foursquare house in 1918, the cabins operated continuously until about 2004. During their twelve-year hiatus, the original three cabins were converted into two. (Fun fact: Cabin 12 takes its name from the combination of Cabins 1 and 2). We are thrilled to be able to reintroduce this charming piece of Lanesboro History! 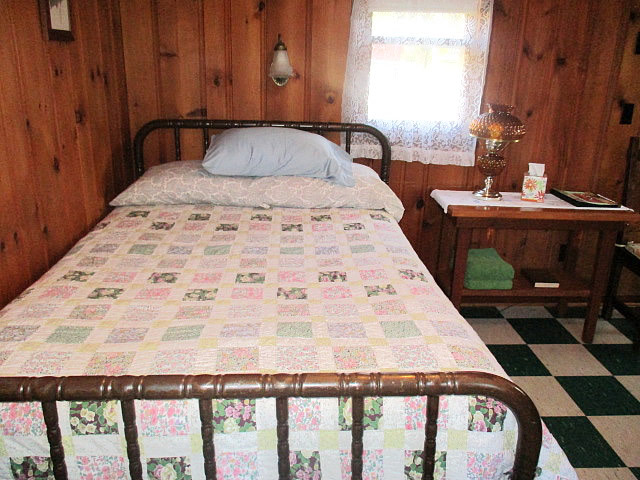 The cabins remain almost entirely in their original state with, of course, their pretty namesake knotty pine paneling. They’ve been freshly painted and repaired. In addition, we’ve finished the later-added adjoining garage into a multi-purpose room for bike storage, fridge access, and who knows what else? We’re excited to see how the use of that space develops, and are continuing to work on landscaping, including a secret garden, and other updates to the property, while committed to maintaining the cabins’ vintage charm and historic character, right down to their skeleton keys! 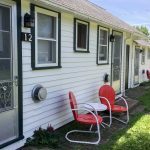 The cabins are located just 1.5 blocks from the Guest Hus, in a quiet residential neighborhood. 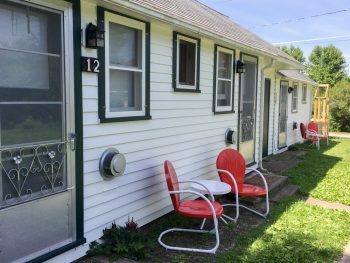 Each has private bath, AC/heat, WiFi, locked bike storage, and fridge access. They are pet-friendly and non-smoking. 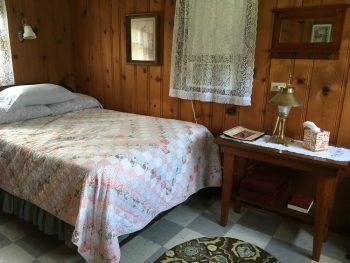 Cabin 12 has two rooms, one with one double bed and the other with a one double futon, and private bath. 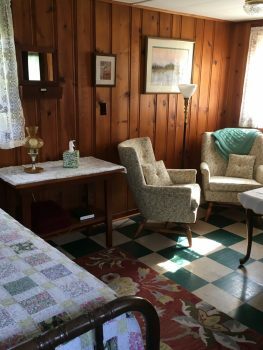 Cabin 3 has one room, with one double bed and reading nook, and private bath. 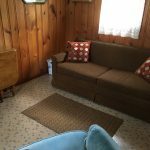 Question: How are the cabins different from the digs at the Guest Hus? 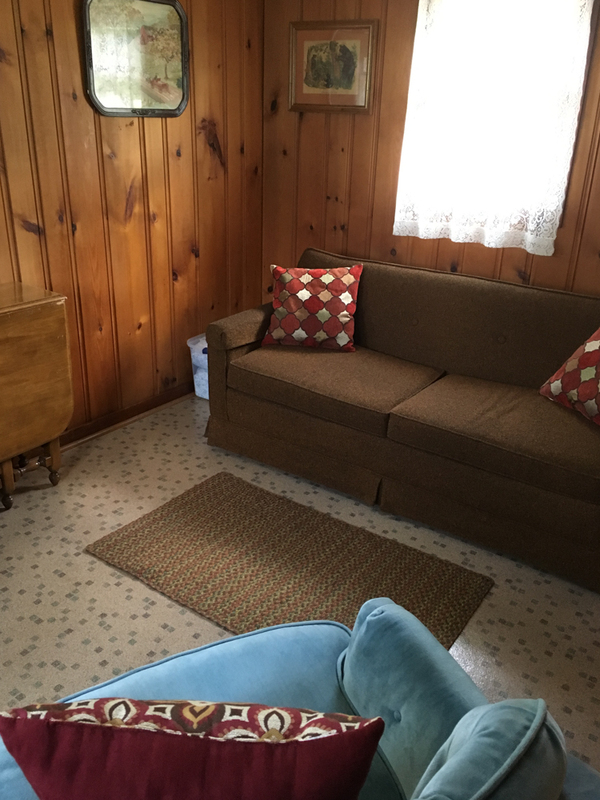 Answer: The cabins are more rustic, with throw rugs (not wall-to-wall carpet), and do not have TVs or clock radios. They are a throwback to a quieter era, and invite you to unplug and unwind. Also, the cabins have a firm two-night minimum (with some exceptions – please contact us). Question: Do I have to bring bedding and towels? Answer: No! 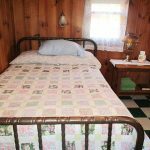 The cabins are fully equipped with the same soft cotton sheets, fluffy towels, and other amenities as the Guest Hus. 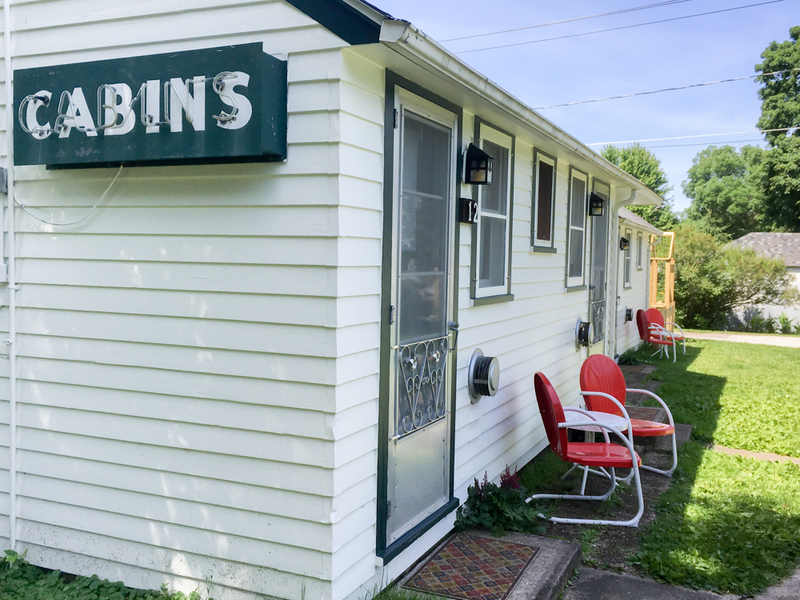 Question: Do the cabins have kitchen facilities? Answer: The cabins have never had kitchens since the 1940s when they were built and we are honoring that tradition. 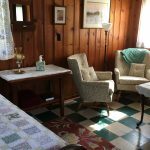 However, there is a small fridge in the multi-purpose room, shared between the two cabins, and guests come to the Guest Hus, 1.5 blocks away, for morning coffee and hot drinks, ice, and microwave use. If you are packing lots of food, you are welcome to bring your cooler, or a small coffee maker; ice for purchase is available just two blocks away. Question: Are the cabins open in the winter? Answer: Because the cabins are not winterized, they are only open from May through October. Contact us today to book your stay at A Guest Hus!